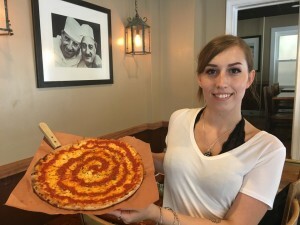 Home » Pitman In The News » The 18 best N.J. pizzerias you’ve probably never heard of… Pizzeria Mannino, Pitman! The 18 best N.J. pizzerias you’ve probably never heard of… Pizzeria Mannino, Pitman! Pitman made my list of 18 Places in N.J. You Must Visit in 2018, and Pizzeria Mannino is the place to satisfy your pizza fix. The Boardwalk, shown here, with mozzarella, aged cheddar, Jersey tomatoes and Sicilian oregano, has swirls of sauce alternating with cheese. Mannino’s Cucina Italiana is next door.